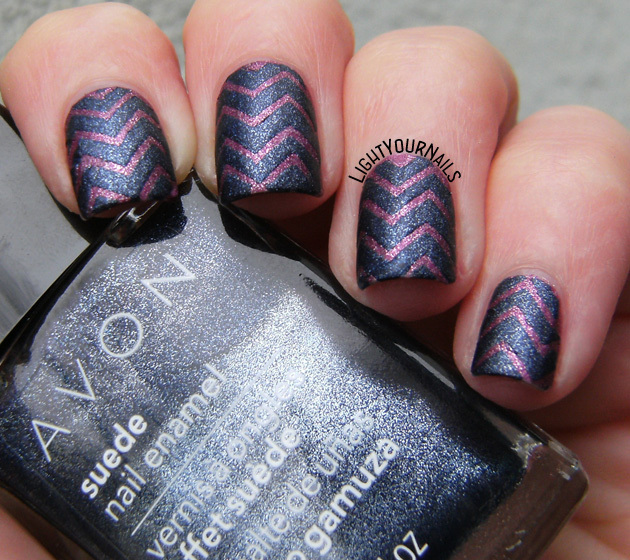 Blue and purple Avon suede chevron | Light Your Nails! Molto carino il risultato, mi piace! Gorgeous pick of colours and perfect work! Love the two polish combination! I totally love this design with these gorgeous polishes! Stunning! Peccato per gli inconvenienti, gli stencil sono davvero pratici :) bellissima combinazione di colori, concordo! It is such a great mani. Too bad you had some issues with vinyls. And having only six of those in a pack is a bit silly. They should put a number divisible by 10. I agree! 10 or either 12 all the same in case you have problems when applying them and you can have 2 as backups! avon is so nostalgic for me. Next time I'll sure use a top coat before applying vinyls! The look that you put together is so pretty!! The colors work so well together! These are cute. I've had the lifting issue when I don't use a topcoat or my base color isn't completely dry first. It makes sense. I'll be sure to top coat first next time! Thank you Gellie! Over here stencils cost so much in local shops, I just have to purchase them online! These remind me a lot of the OPI Suedes! Love the chevron design! Ti sono solidale per l'inconveniente, anche a me è capitato che lo stencil si portasse via lo smalto sottostante. Ho parzialmente risolto scaricando un po' la potenza adesiva sulla pelle, ma evidentemente non abbastanza (per paura che poi non aderisse più bene e sbavasse) perché ho comunque avuto qualche buchetto qua e là. Ad ogni modo, a parte tutto, il tuo risultato finale mi piace molto! E' un bell'abbinamento. Would it work to use a matte topcoat before the vinyls over suedes without killing them? vinyls do work best with topcoated nails. It's probably the only way to make it work and leave it matte!